King of the Mountain Unsurpassed 360 degree views and luxuriant living await you in this mountaintop estate. Pass through the electronic gated entrance and follow the upward curving drive until you reach this majestic manor. Offering over 4,600 square feet of living space, there are 5 bedrooms, 4 full bathrooms, a capacious office, a great bonus room, large laundry room and 2 dining rooms. A grand entrance leads to a spacious living & formal dining-room large enough for a dance floor or a magnificent party . The combination of the kitchen, dining room and family room together make a terrific and inviting space for parties and even large gatherings. This area has a wall of windows looking out towards the infinity edge pool and grand sunset views and brings the outdoors inside for full enjoyment. The house is equipped with 3 propane fireplaces creating ambiance and warmth. The two master suites are on the opposite ends of the house with one having a completely updated master bathroom replete with a lovely chandelier over the large bathtub, separate shower, dual sinks, closeted toilet creating a relaxing spa-like feel. 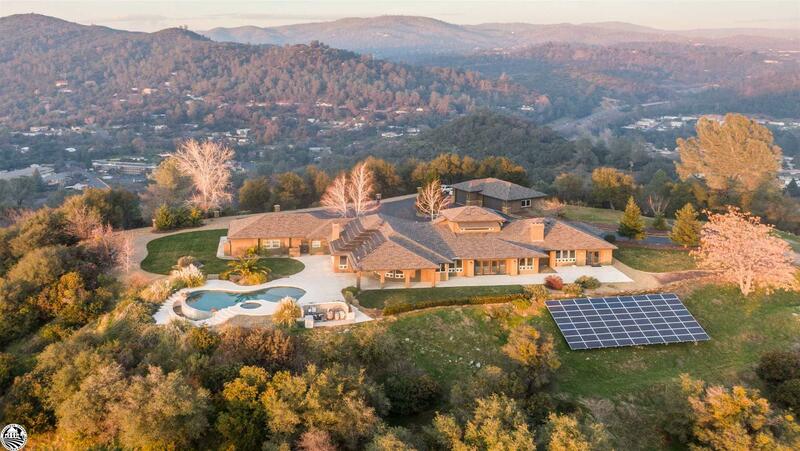 No need to be concerned about outrageous electric bills with 72 solar panels. Immense care and attention was put into the extensive and lovely landscaping including hand-stacked rock walls, multiple lawns and numerous planted trees and shrubs. The outdoor entertainment area has built in speakers in the covered patio which covers an immense space of stamped concrete decking. The dreamlike negative edge pool has a built-in hot tub and passive solar heating. There is a 4-car attached garage and a 2 car detached garage with another large RV garage with hook-ups or roomy enough for a 30 foot boat. A beautiful wrought iron fence surrounds part of the property and the paved area also has large area for RV parking. The well was recently tested and produces 30 gallons a minute. There is an additional 3,000 gallon water storage tank, along with a 20 KW generator with installed grid transfer. This magical mansion will truly make you feel like royalty.